FSFE calls for an amendment that would eventually enable Free Software and Creative Commons licenses for Slovak citizens. Currently, these licenses are considered to be void due to lack of their written form and problems with formation of the contract. Slovakia is thus one of a few countries where these popular licensing tools still struggle with rigid legislative framework. During the last week, FSFE therefore sent support letters to four members of Slovak Parliament that proposed this highly awaited amendment, but later faced its dismissal due to preliminary elections. Now, we want to make a sure that this important issue will not drop from the agenda of political parties. If you also feel that another 5 million Europeans should have this option, please support our action and write members of Slovak parliament (regardless of your residence). Explain them what is your experience with Free Software or just reuse our letter. Your support is important! There are many reasons why we believe this is important for Slovakia and its citizens. 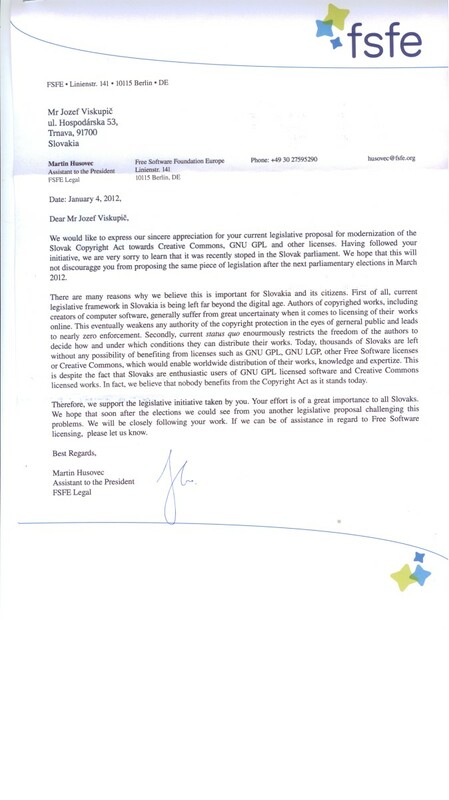 First of all, current legislative framework in Slovakia is being left far beyond the digital age.Authors of copyrighed works, including creators of computer software,generally suffer from great uncertainaty when it comes to licensing of their works online. This eventually weakens any authority of the copyright protection in the eyes of gerneral public and leads to nearly zero enforcement. Secondly, current status quo enourmously restricts the freedom of the authors to decide how and under which conditions they can distribute their works. Today, thousands of Slovaks are left without any possibility of benefiting from licenses such as GNU GPL, GNU LGPL, other Free Software licenses or Creative Commons, which would enable worldwide distribution of their works, knowledge and expertize. This is despite the fact that Slovaks are enthusiastic users of GNU GPL licensed software and Creative Commons licensed works. In fact, we believe that nobody benefits from the Copyright Act as it stands today.